One bite in and I knew I hit the jackpot with this one. If you’ve been in search of the perfect crispy, baked tofu recipe, this is the one for you! I’m so excited to share this with you guys I can hardly stand it. Let’s do this! For starters, this dish is served over cauliflower “rice” instead of regular rice because 1) Cruciferous veg for the win, and 2) You can eat an ENTIRE head of cauliflower instead of 1/2 cup of rice and STILL only consume a fraction of the calories and carbohydrates, so why not?! Cauliflower rice is SO simple and you absolutely must try it! It doesn’t pass completely as rice since the textures and flavors are slightly different. But it looks just like rice and in my opinion, tastes even better as it absorbs the sauce perfectly and takes WAY less time to cook. You guys know the deal: My favorite way to crisp up tofu is pre-baking it before sauteing – a little trick I picked up at a vegetarian cafe in San Antonio (Yes, I hounded the waitress for the technique – you’re welcome). This gives it that crisp outer edge and perfectly tender center. 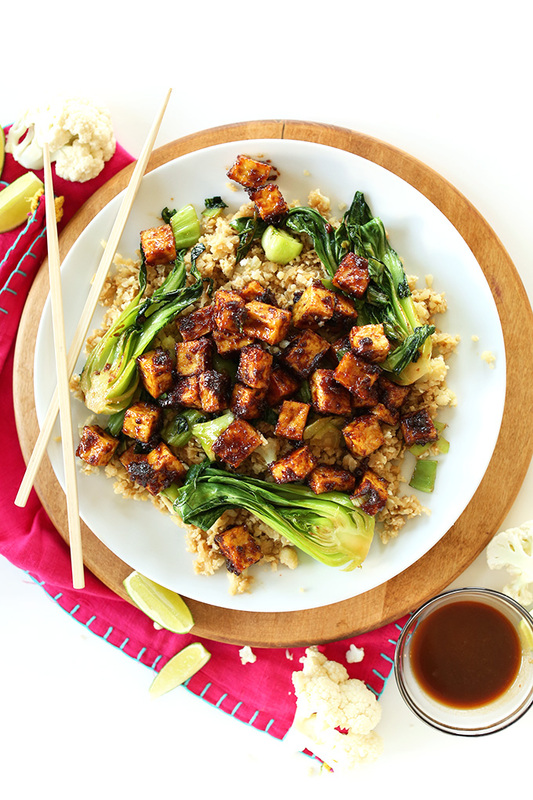 Once your tofu is baked, add it to your sauce, which acts as an all-in-one marinade and sauce for the cauliflower rice, veggies and for serving! It wears many hats and it’s oh-so delicious and Thai-inspired. Once your tofu is marinated, it’s ready for a quick stir fry to give it that perfectly golden brown, crisp, mega-flavorful coating. 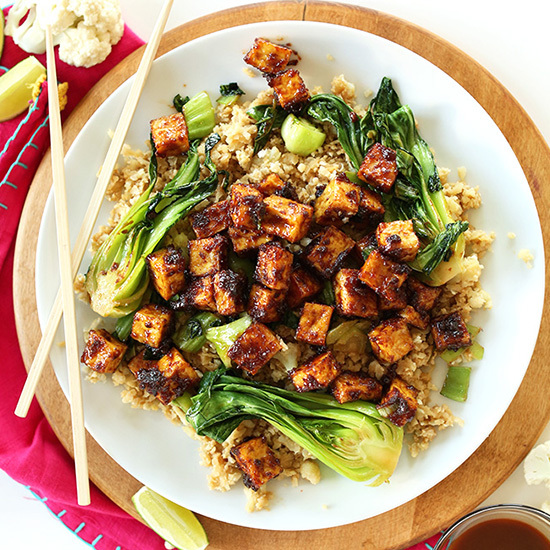 Then all that’s left to do is saute up your veggie of choice – baby bok choy for the win – and your cauliflower rice! All in all this dish takes around 1 hour 30 minutes, which is a little longer than I prefer. But the pay off is so worth it! Plus, it only requires 9 ingredients – many of which you likely already have on hand. I made this dish and ate half, then reheated the leftovers the next day and I swear it got better! I love it when that happens. Hope you enjoy this dish as much as I did. Cheers! Crispy tofu that's baked, not fried, and tossed in a 5-ingredient peanut glaze! Serve over cauliflower rice with sautéed veggies for a completely plant-based meal that's entirely vegan + gluten free! Rinse your pan under very hot water and scrape away any residue. Place back on oven. *My block of tofu was 16 ounces, so I removed a small amount because 1 pound is too much for this recipe. Adjust the amount of tofu and sauce for the amount of people you’re serving. OH MY GOODNESS MY DAUGHTER ATE HER VEGGIES!!! Yes they might have peanut sauce on them but hey it’s a start!! OMG this is sooooo good! I loved the sauce so much I now sometimes make only a double bath of the sauce and make a stir-fry with it to out over a grain. Sooooo yummy. The tofu really comes out perfectly too! Definitely recommend this recipe . I use low sodium soy sauce. I used liquid aminos instead of soy sauce – same amount as per recipe – and it’s waaayyy too salty. recipe a nice different taste with a combination of sweet and spicy flavor. Yummy!! Just tried this for the first time and I’m hooked! Never cooked with tofu before but just thought the sauce sounded so yummy. I did change a couple of things – added minced garlic and Chinese five spice to the sauce and used crunchy peanut butter for a bit of texture. Loved it! Also ‘noodled’ some zucchini to add to my veggies which was broccoli and mushroom. That’s what we like to hear! Thanks for sharing, Rebecca! Seriously delicious recipe! 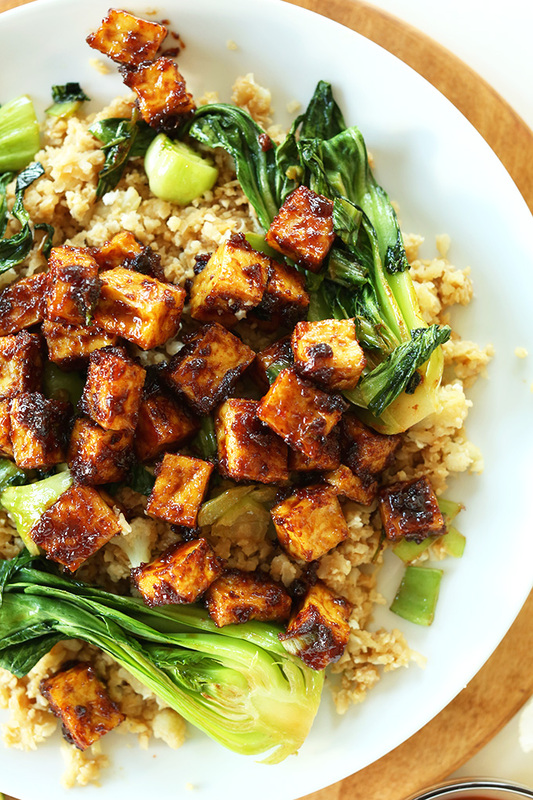 I’ve made this 3 times now and I’ve found it actually works better to bake the tofu in the marinade then add it into the stirfry at the end – when I try to fry it I just get a lot of burnt stuff. Thank you for this easy and flavor-full recipe! I make this at least a couple times a month, and one of my little kids even loves it. My husband asks for it all the time. I love how adaptable it is depending on what veg you have in the house, and I often brown some slice alomnds in a bit of olive oil, salt and garlic and sprinkle over the top for a zingy crunch. I usually serve over regular rice for the kids, and over rice or cauliflower rice for the grown-ups depending what I have in the house. Question, how long is too long to marinate the tofu you think…could I do it for a few hours to overnight or would that be too much of a flavor smack…thanks! Hey y’all! This is a must try! I’ve made this twice for my fiancée and tonight was the second time. We both love it! I’m a big meat, chicken and all around protein eater however this is now becoming a new addition to my diet. I plan to make this for her once a week when we marry. This is one of my go-to recipes now. I’ve made many versions riced cauliflower/rice/brown rice noodles and broccoli/green beans etc. Keep the peanut sauce with tofu the same and it’s a home run every time. Whoop! We’re glad to hear that, Laura! This was so good! My husband said it was one of the best meals I’ve ever made. I love the crispy tofu method! I used regular soy sauce (not low sodium) and it was way too salty. Added some coconut milk powder, water, and lime juice to offset it and then just added a little to the rice and served it on the side. Used sliced mushrooms and broccoli and topped with cilantro. Thank you for the great recipe! This recipe looks yummy. I have found that “Freezing” the tofu and letting it thaw removes most of the moisture and eliminates all the steps of draining, pressing, etc. Have you tried that? The is the second time I making this dish…..It’s fantastic thank you so much. I have one question can I make the tofu and marinade over night. Trying to same some time. I am obsessed with this recipe! I found it on Pinterest about a year ago and, no joke, I’ve made it about 20 times now. It’s AMAZING. When I’m done cooking it and eating it, I go back and lick the spoon before washing up the dishes. I’ve tried it with all types of different veggies and on top of brown rice, quinoa, and cauliflower rice. SO GOOD! This is my first time cooking tofu. How come it crumbled when I rolled it??? Can you clarify what you meant by “rolled” it? Do you mean when you pressed it? Tofu can be a little tender, which is why we recommend working with extra firm tofu for the best results. Hope that helps. I made the tofu last night. It was honestly better than any restaurant tofu I’ve ever had! I didn’t have any garlic chili sauce so I substituted it with some pineapple hot sauce. That was my only adjustment. Thanks Dana for another lovely recipe! My mother made tofu 30+ years ago and I grew to hate it, the recipes were horrible and bland. I’ve been terrified to scar my own 13 year old with a similar experience. So this is the first tofu I have EVER cooked. It was NOT the tofu nightmare of my childhood. This was absolutely delicious! Thank you so much. It was a huge hit! I made mine with baby bok choy, red pepper, and green onion. I may add more vegetables next time. Could you recommend some alternative to peanut or almond butter? Probably the most delicious tofu I’ve ever had, thanks a ton for sharing! I usually don’t do comments but I couldn’t stop myself this time. Thank you! Thanks for swiping the perfect technique for crispy tofu! I used to get the same results just stir frying, but it would require more oil than I’d like to use in my food. This is awesome. I’ve been eating tofu my whole life and this is def the best tofu I’ve had! It was so crispy and perfect and the sauce carmelized and stuck so nicely to the tofu. 10/10, making this again soon! Made this last night – that sauce is crazy good. Used way too much and probably defeated the purpose of the healthy recipe but so worth it. Made the tofu and sauce part of this, to go with the quinoa fried rice recipe. Didn’t pay attention to the instructions and had no time to press the tofu first or to marinate after baking for more than a couple minutes, and it still turned out perfect! The sprouted tofu I’ve been using has been sticking to my pan no matter what I try when frying, so this technique of baking is a game changer! Hi, I’m not vegan but I have an 18 month old who won’t drink milk and I heard that tofu is a great source of calcium. I’ve only ever had tofu once and it was in a soup I was served at a restaurant. It was soggy and hollow and didn’t taste like anything, so I was not sure what to expect when making this. I made this today and followed your recipe carefully. I absolutely loved the flavour and was surprised that something so tasty had been made from scratch in my kitchen! It was easy to make and delicious! The only thing was that the tofu was not crispy but rather rubbery. What did I do wrong? I will definitely be making this again, I might substitute the tofu for chicken and serve with soba noodles next time but I do want to perfect the tofu as it seems like such a versatile food, healthy, cheap and nutritious. Oh my gosh! I’ve been looking for a way to make tofu that is crispy outside and tender inside… Instead of rubbery chunks. I can’t wait to make this! Thanks! We hope you love this recipe, Karen! I made this today, but served it over rice. The cauliflower I have is earmarked for tomorrow’s dinner. The veggies used were onions, green pepper, and baby bok choy. There was not a morsel left! My mother and brother agree that we’re going to add more chili garlic sauce next time, and will substitute cashew butter and a handful of cashews. We are not vegetarians or vegans, but I have been making a lot of meat free meals. Thank you for adding to my repetoire. This looks absolutely delicious! What do you recommend as a nut-free substitute for the peanut butter? I desperately want to make all these peanut-y dishes but my husband is extremely allergic to all nuts. Would sunflower butter taste alright? I would think that sunflower butter should work! Just made this and it’s already my new favorite meal! It was so easy to make and delicious, thank you! This is my favorite recipe so far from Minimalist Baker! We made this during our first week going vegan and my three kids and husband all loved it! Shocking! I love this method of baking the tofu so that it comes out crispy on the outside. This is genius. Sometimes I make the tofu, sauce and veggies and service over whole wheat pasta. This really gets the kids excited. To make this recipe lower in fat, I cut the oil and the peanut butter in half for the sauce. It still tasted fantastic (although the original recipe is the best!). This dish is sooooo delicious! My only recommendation is to double the recipe as it is currently set for only 2 servings. I guarantee you’ll be sad not to have leftovers. In fact, I made this 2 nites ago and made it again tonite! My husband and I love the flavors, texture of the tofu all on a bed of healthy, low calorie cauliflower rice. YUMMY! I recommend making it with the suggested sauteed veggies (I used red bell peppers, green onions and kale). Also did the fresh cilantro and lime. Thanks for a great recipe that has become my new favorite!!!!! Sooooo I made this recipe last night and lol the tofu was a trickster!!!! I made the first tofu in the oven and it turned so hard so fast ? lol I was panicking so the little I did save I managed to use that but skipped the baking portion and it turned out delicious. I think my oven gets super hot or I may have let it dry out to much…. but delicious recipe! Just keep an eye on that tofu! I made this with feto fermented tofu and a mixture of vegetables including red pepper, green beans, courgette, mushrooms, aubergine etc. We halved the amount of sugar and also added sesame seeds. Used Meridian crunchy peanut butter. It was really delicious and easy to make, and certainly plan to make it again, as well as trying more of your amazing recipes. I’m really grateful that you use metric measurements as well as the American cups, which we find hard to use in the UK. Thank you for sharing your recipe changes, Sarah! We are glad you enjoyed it! OK, I don’t normally bother commenting on blog recipes because I do rarely find one that I truly love but this recipe is completely amazing! The sauce is so delicious and easy to make without normal storecupboard ingredients (instead of chilli garlic sauce I used garlic powder and hot pepper sauce). I had already made oven baked tofu so this wasn’t new to me but an excellent use of the technique here. This is going to become a staple for me – thank you! I finally had to come leave a comment after making this for the… 10th time. This recipe has that WOW factor for reheated lunches. You can make the best meal, but sometimes, especially on day FOUR, you just avoid the leftovers in the fridge at all costs. Not this one though. It’s one of those dishes that almost gets better after the flavors all marry. And the tofu doesn’t seem to suffer from the fridge time or reheating. Highly recommend for batch prep! We are so glad to hear that you’re a fan of this recipe, Lauren! Thanks for the review! Tried the tofu tonight and loved it!! I always have trouble with mine being overly sweet or Salty. I used regular soy sauce so I added more brown sugar and peanut butter as well as thinned it with some water. Will definitely make again!! Glad to hear you enjoyed it, Theresa! Thanks for sharing your recipe changes! Delicious! I added carrots and broccoli to the stir fry, some grated ginger to the sauce, used 14oz of tofu, and probably had a larger head of cauliflower than called for. I didn’t have reduced sodium soy sauce, only regular, so it turned out a little salty for my taste, but still good! I think next time I will add a little extra peanut butter as well. This made plenty for both my husband and I with leftovers to spare. Thank you for the recipe! Great! Thanks for sharing your additions, Lia! Mmmmm what a great start to my plant-based diet! Deliciously rich, but not heavy. Perfectly sweet and tangy, great recipe! My belly is so happy right now! I used half coconut sugar, half honey for the sauce and it just turned out brilliant. It took some extra time for sure because of all the components but I suspect it will be a lot easier the second time around, especially if I pre-bake the tofu and pre-mix the sauce ahead of time. We are so glad you enjoyed this dish, Natalia! Excellent recipe! One heavy meat eater called it, “the best cauliflower that I ever ate.” I used coconut brown sugar for the sauce and only used half the suggested amount. Rather than switching the tofu from the oven to a pan, I put it back into the oven after marinating to avoid a messy pan. Baby bok choy and red pepper were a fabulous addition. Again, we loved it! Thank you! Yay! We are so glad you enjoyed it, Emma! This recipe is time consuming-and worth every minute!!! One of my family’s favorite recipes. It’s in our regular meal rotation. I have been trying various tofu recipes to get more of it in my diet, and this recipe by far is the best I’ve had yet! Delicious. I love how crispy the tofu gets from baking it first. Thank you for all of your great recipes! In Justine getting into cooking. How would you suggest cooking the extra veggies? (Broccoli back Choi etc). THabks! You could steam or bake them, depending on what vegetables you choose! I used to hate tofu and this recipe is helping me learn to love it! I added a splash of agave instead of brown sugar and added a bunch of veggies. It was so delish! Yay! We’re glad to hear it, Kayla! I made this last night for my friend. WOW is all I can say! We both ate too much of this amazingly good dish. Happy bellies. OUTSTANDING!!!! Putting into our regular rotation. Thank you for your creativity! I wish I had taken a photo, but didn’t. This is a delicious recipe! Only used the sesame oil in the sauce, and that was plenty. Sautéed veggies plain, added mung bean sprouts, peppers, bok choy, broccoli, green onions. The tofu turned out delicious! Thanks for a great recipe!! We’re glad you enjoyed it, Sarah! Hi Jean! We’re sorry that is the case! What browser and device are you using? If you see that again, can you take a screencap of it and send it to support@minimalistbaker.com so we can get that sorted out and make sure it doesn’t happen again? Thanks! Made this last nigh and it was amazing!! So yummy! I made the tofu according to this recipe but then had it with brown rice and stir fried vegetables instead! As the recipe said I added more peanut butter and sweetener until I liked the flavour of the sauce. Can I replace the brown sugar with coconut dugsr or will it change the taste quite a bit? Thanks! Hi Weena! It might affect the texture, but in this recipe, it should work fine! I followed the recipe, but really didn’t enjoy the tofu. Veggies and sauce were great. We’re sorry you weren’t a tofu fan! It can be a hit or miss ingredient, but glad you enjoyed the vegetables and sauce! I frequently make peanutty tofu I use a little sweet chili sauce for a tad bit more depth of flavor, but it is sooo good. The only problem I have had is it takes forever to pan fry tofu to get it crispy, I am so excited to do the oven trick… I have some tofu going in the oven! Luckily I’m the only one in the house that likes tofu… yes! I have a mouth watering lunch for tomorrow! I am following you recipe to a T, have already tasted the sauce! So good! Thank you for sharing and keeping the recipe up!!! What is chilli garlic sauce please and would I find it in the cold isle or preserves? Hi Katie! You’d likely find it on the shelf with the other sauces. It should look something like this! I’ve made so many of your dinner recepies, they’re amazing! Thank you for making so many vegan options! This was absolutely amazing– well worth the effort of draining, toasting, frying, mixing, processing, frying, and frying some more. I just want add that my pan never browned and so I never had to clean it between frying sessions. It’s one of those Copper Chef ones– use that. I will be making this again! I absolutely love this recipe! It is so good, even my husband who normally hates tofu and would prefer meat really likes it! To save time on a weeknight, I use a bag of frozen riced cauliflower & a bag of frozen stir fry veggies. It is sooo delicious, we have it once a week now. I made this last night for meal prep lunches and just ate it today. It’s my first time using cauliflower rice and 2nd time using tofu. It was soooo good!! I sauteed up some diced carrots, celery and onion first, then added the “rice” and let that cook for just a few minutes. I placed that into the meal prep containers, then sauteed the tofu that had been baked and marinated in the peanut sauce. The sauce was delicious, and baking the tofu before sauteing made it nice and firm, instead of mushy. I will definitely make this again, great recipe, thank you! I made this recipe as written. On the positive side, it introduced me to cauliflower rice, which I had never tried before, and I really like it. Making it in the food processor with the fine shredding disk is a cinch. On the negative side, the baked tofu came out as hard as a rock, and we didn’t like it at all. Also, the sauce was just too strong, and I like all the ingredients! When I diluted the leftovers with other stuff (picked out the tofu!) we liked it much more. Very good, all of it. The cauliflower rice felt like rice in the mouth. Good tip on baking the tofu first. It helped the sauce stick to the dried tofu. I warmed up the sauce in a small pot because I found the peanut butter had a hard time getting incorporated with the other ingredients. It worked well. Put some of the sauce on the cauliflower rice and bok choy. Overall, 5 stars! Thanks! This sauce is pretty darn good. I marinated some sliced carrots and broccoli with the tofu and it all cooked up beautifully. I do like some heat, though, and used red pepper flakes to spice it up. I’ve been making variations of this recipe on the regular. I love it! Thank you. 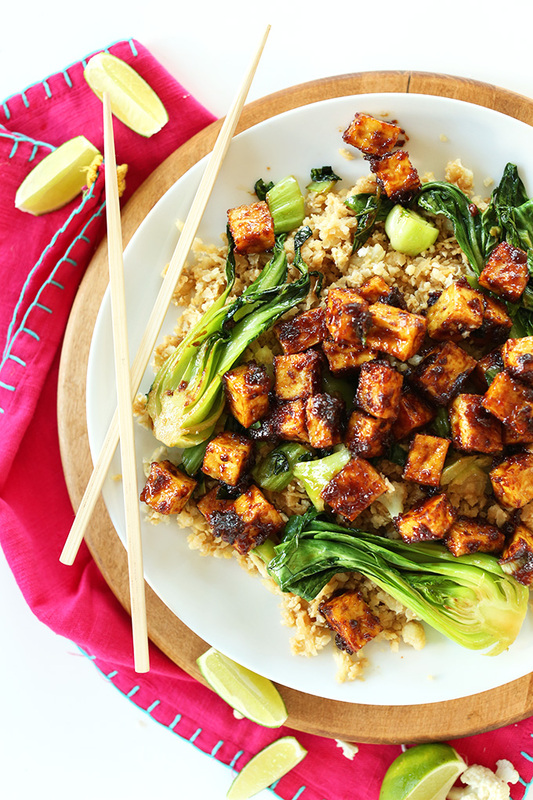 I tried this recipe a few months ago, but my kids didnt like the chewy texture of the baked tofu, and my husband didnt like the state of the wok afterwards. So I altered it. I dont bake the tofu – ours is a locally made, super-firm tofu. I do use a rubber spatula to stir-fry it, and its fine. I use a home-made hot sauce in the marinade, about 2 tb. I drain the marinade, slowly stir-fry the tofu in a wok, stirring occasionally, until its starting to be pretty well browned. Then I add the bok choy or nappa or snow peas, stir maybe 2 more minutes. then I add in the marinade, some honey and pb, and some boiled broccoli and cauliflower. and i serve it on regular rice. My family – me, hubby, 21 yo son and 14 yo son – LOVE this dish. I know its not the method you used, but its the same ingredients and I make it almost every week! Could you marinade the baked tofu in the sauce over night? Sorry! Saw my question has already been answered. I loved this recipe. I made it, but with a few tweaks due to my own laziness and to use up veggies on hand. Laziness was that I just used rice that I had on hand instead of making cauliflower rice. Also, I had a bunch of brussel sprouts that I needed to use, so I quartered them in place of using bok choy and broccoli. The tips to dry out the tofu and get it a bit more crispy was really helpful! However, I did find the combo of oven temp and time to be a bit much. It basically cooked the tofu, and tossing in the in pan with the sauce and veggies was just heating it up. But I’m just noting this finding, not complaining. I also personally used the entire 16oz package of tofu and didn’t find it to be too much for us. I just kept adding quartered brussel sprouts until the ratio looked good. The sauce was fantastic! I will be making this dish again soon and bringing to my sister’s house for a weekend potluck. This was a success! My 1st tofu dish I ever made and it was delicious! I sauteed green beans and onions. Skipped the cauliflower rice in favor of brown rice that I had on hand. Made this tonight. Absolutely delicious. I realize this was posted a long time ago. Still very good!!! I added black beans to mine. Love the sauce but the tofu was very chewy. Any thoughts on how to avoid that? Hi! It may depend on the type of tofu you use because we’ve used a few “firm” tofus and some are more firm than others. We would recommend turning your oven down to 375 and maybe only baking them 20 minutes or less. Tofu turned out chewy. Bummer. Looks amazing! What can I use instead of chili garlic sauce if I don’t have any on hand? Hi! You could try a dash of minced garlic and a dash of chili powder or red pepper flakes. You could also try sriracha with a little bit of minced garlic! This looks delicious! Thank you! I’m planning to make it for a dinner party but have never cooked with tofu before. Do you think it would be just as good if I drained, baked and marinated the tofu the night before then fry it up 24-hours later? Or would it go soggy? I made this tonight and it was AMAZING. The only change I made was cook the cauliflower rice right after the veg. This was outstanding! The flavors meshed just perfectly and my family who “doesn’t like tofu” loved it. Thank you for the inspiration! I’ve been wanting to try the bake-and-stir-fry method of cooking tofu for such a long time and never gotten around to it, but I finally have and this is DELICIOUS. I ate my leftovers right out of the fridge, and they were still great; I’ll definitely be making this again! DO IT. This is the best tofu I’ve ever had. Amazing recipie! Tasty, satisfying, and worth the time. Even my 3 yr-old ate some of it! The “rice” looks and seems more like couscous than rice, which I think I might like better. Love rice, though. Looks really lovely and light. Can’t wait to try. Oh, my goodness. This was fantastic. I might actually prefer the sauce as a dipping sauce for the tofu, but it was amazing as is, too. Oh no! It shouldn’t be extremely salty, no – I hope you have better luck next time! I am not sure what went wrong..
Just made this recipe for a Taiwenese vegan friend. Oh my – soooo good. Sauce was a bit thick so will work on that – definitely a repeat. Loved the texture that baking then frying the tofu provided. So did my friend. Had to substitute sweet chilli sauce with garlic for the chilli garlic sauce. Still worked out fine. The lime and coriander is a must. To keep the Tofu from getting tough and hard I just warmed it up in a pan, and poured a little of the sauce on top. Delicious of course, but this recipe kinda defeats the purpose of Tofu being a low fat, low sodium food. This tastes like Tofu candy. I loved the cauliflower rice. It cooked up exactly as described. I loved the peanut sauce, though mine was a bit thick and I added a tbls of water to thin it out. It was flavorful and delicious. What I might do differently next time is not “crisp” up the tofu. It seemed tough and unpleasant. I may have baked it a bit too long, but I think I might have enjoyed it a bit more if I had skipped this step, since I bought “super firm” tofu to begin with. Overall, what a fabulous and creative recipe. I am sure I will try this again and again. Thank you for it. I will try more of your recipes based on the success of this one! Really good, will make this again and again. This is my all time favourite tofu recipe. My boyfriend doesn’t even like peanut butter and he still enjoys it! I made it for his family, and his mum said it was the best stir fry she’d ever had, which made me pretty proud. I love the texture the tofu gets from being baked. I made this for dinner tonight; I was never a huge fan of todu until now! We have company coming later this week and I plan to make this for them. I love the cauliflower rice in this recipe but may try to substitute it with some bulgar wheat for added fiber. SO, SO GOOD!! I added a bit more of the chili garlic sauce, but baking the tofu and soaking it in the marinade before heating it all up gave it the most amazing caramelized coating, it was so delicious! I kept stealing bites out of the pan while I waited for my rice to finish cooking! My bf isn’t a huge fan of tofu, but he definitely enjoyed this one! Thank you for posting such a yummy vegan dish! I added 1/2 Tbsp of ginger to the sauce, and it was delicious! Yum! Turned out great with medium tofu. I let the tofu rest for an hour in the warm oven after baking it. So good! Thanks! This is actually my first time on your site – i’ve been following you on Instagram – and I’m so happy I checked it out. Bout time I actually find the yummy recipes for all the food pics I’ve been drooling over! Literally the best tofu I ever ate! I always had a hard time eating tofu due to bland/texture but baking it then frying really takes the unpleasant spongeness out of the tofu. The only thing I changed in this recipe is adding a dash of liquid smoke and black pepper. Will make again and definitely will prepare tofu like this from now on. Delicious! Healthy. The sauce to coat the tofu was delightful and I will use in other recipes. This meal will be one of my regulars. Thank you. Made this for dinner last night! I’m eating leftovers for lunch right now and I’m very happy. I used orange bell pepper and frozen broccoli for my veggies because that’s all I had on hand. Turned out great! Will definitely be making this again. I have made several of your recipes and wanted to tell you that the crispy tofu in p-nut sauce over cauliflower rices is the best!!!! OMG it’s soo good!!! THANK YOU! I’m not sure I’ve ever commented on a blog in my life – I’ve made so many of your recipes, I love your cookbook – but THIS. OMG THIS. I’m 1/4 into my bowl and I had to stop everything and comment – this is absolutely delicious, and I’m not even a huge fan of tofu. I literally cannot stop talking about how good this is – my husband is already annoyed. Nice recipe. The website, however, loads terribly on my phone. * I really appreciate the tofu tip – I flipped them once mid-bake to even out the drying & crisping, which worked great. * Love the idea of cauliflower v rice & look forward to trying it. Thanks again! Used Peanut sauce to marinate french fry sized cuts of tofu then baked and ate. Excellent! Thanks for the recipe. I just made this last night and am currently enjoying it for lunch! Love it! The technique used to cook the tofu is a game changer, thank you! I added some extra veggies that I had on hand to round out the meal and ended up using a bag of Trader Joes frozen cauliflower rice to speed up the prep time. I’ll be eating it for lunch all week! The only thing I will change for next time is the baking time for the tofu. I think I overcooked it a bit, so in the future I’ll do 18-20 minutes instead. I tend to avoid anything that is advertised as vegan and gluten free but have been trying to reduce my meat intake for environmental reasons. This recipe was WONDERFUL. It took a while to prepare but I loved the texture, flavor, and huge amounts of nutrients per bite. At work we have a healthy living group-we talk alot and try new things. A coworker talked last week about tofu. I looked up tofu recipes for our healthy potluck and came across this recipe. I figured I would try it and be done withtofu. Oh my goodness!! I will definately make this again! It seems complicated at first but was actually very simple. I cheated and bought my cauliflower rice from the frozen food section. I added a few more veggies to make is stretch a little further, bok choy (new to me and so yummy) and red peppers. I couldn’t wait for the potluck tomorrow-had to eat some today. Oh and I also bought the firm tofu already cut up. I am a lazy cook. Thanks for a keeper recipe! I am a newbie cook and I even managed to mess up a few steps, but this turned out so amazing. My boyfriend loved it and he claims he hates tofu. This is just perfect and I will definitely be making this again. Thank you! I made this for dinner last night, and it was so delicious! I love a good peanut-y tofu or tempeh…this really hit the spot. I was slightly lazy last night, so I went with brown rice instead of the cauliflower. I will be making this again, and next time I’ll make it with cauliflower. It looks So yummy. I have to try it. Thank you Dana! I’ve never bought “chili garlic sauce.” Would they have this at Whole Foods? Is it a red sauce? Any guidance is great, thanks! Hi Michelle! Whole Foods should have it, but any local grocery store should carry it as well! Hope you spot some on the shelves! Good luck! Wonderful, thanks. Really liking your websites and the awesome recipes. You have a gift for sure and thanks for sharing it! I could not find it at our local Meijer store, but I found it at the local family fare store by the Asian sauces. It only takes a very small amount so really not a huge issue if you subsitute I am sure. Freakin’ delicious. I used baby bok choy, red bell pepper and zucchini for the veggies. Sauteed them in a little oil, garlic and salt – first the pepper and zucchini and then adding the bok choy when it was just about done. The cauliflower rice was delicious, along with the sauce. MMMMM!!! My boyfriend loved it too. Perfect for anyone on a low carb diet. Just made this amazingness! Added a little more PB and honey as suggested, but also added a large clove of garlic and ginger paste to give it a little more dimension. Super good! If I pre bake the tofu the night before , would that still work ? Thanks ! My husbands first time eating tofu and cauliflower rice. He didn’t know it was cauliflower and ate the tofu! I would call it a success. I personally loved it!! Wow, that was so delicious! Perfect Sunday night dinner or any night dinner. My husband LOVED it! “That was delicious honey” he couldn’t believe the rice was cauliflower. I’ve always wanted to try that, I couldn’t believe how good it was! Great meal! 10/10! This is a keeper! I doubled the recipe because I wanted left overs. Added extra veggies as well (red pepper and onion). I made the sauce the day before I needed it. The sauce really thickens with time so I I added a bit of water. The sauce would be great for a thai salad or dipping fresh rolls. Everyone loved this recipe. (There were no left overs by the way.) Can’t wait to make it for my daughter when she comes home from university! Wow! Delish. Anything with peanuts is my weakness. I was surprised to find i loved the cauliflower rice, probably because I threw in a little of the sauce. I found the “marinade” too thick and I followed the measurements precisely. I even weighed the sugar on my scale. I did add more peanut butter which I’m sure didn’t help, it was more a jam consistency than a sauce. Probably I need to add more soy sauce or water. This recipe is so insanely delicious! I don’t even like tofu that much and I used this recipe to try and find a way to cook it that I like, and it worked. This is so easy to make, so so so delicious, and so low calorie! It even tastes great reheated on day two! Thank you!! What is a substitute for peanut butter or almond butter? My son is allergic to peanuts and treenuts. Thanks! Hi! I haven’t tried it but you could try sunbutter as an alternative? If you give it a try, let me know how it goes! Loved this method of making the tofu firm and crispy without deep frying! I used fresh garlic + dash of hot sauce in place of the chili garlic sauce. I also skipped the sugar/honey and added some fresh grated ginger. Paired with broccoli, mushrooms, red pepper, and quinoa. This dish was amazing and completely satisfying! Filled me up without making me feel overly full. The flavors blend well together….I added fresh pineapple to the sauté which was perfect for us. Just made this dish tonight. My very skeptical husband loved it and so did I. Thank you for posting this amazing recipe! This was delicious! I will definitely make it again! I unfortunately did not have the cauliflower, or some of the other ingredients to make this recipe, but I used the sauce, and my own vegetables in the house, and it was wonderful! I now know how to properly make tofu crispy, and whenever we have tofu in the house this is what I make. I love this website and I get so many good vegetarian/vegan recipes. We make this almost weekly!! I’ve made it exactly as written and also with our family’s favorite twist… We love serving it over coconut basmati rice! Letting the tofu sit and dry definitely makes the dish, but I will admit that when I need a quick throw together dinner I’ll bake the tofu and cook it right away with the sauce. Not as good but still delicious! Can you tell me how much Potassium in this recipe? We loved this! Will make again for sure. I would definately use the low sodium soy sauce the recipe calls for. I didn’t have any and had to add a bit of water as it was too salty otherwise (and I love salt!). Thank so much Dana and John! This recipe is wonderful, will definitely be made again! Really good. I made it with both cauliflower and rice. Will triple the sauce next time. I also added a bit more chili sauce as we like a little kick. I’m planning to make it tomorrow evening but I only have one little square of tofu left (about 90gr). I do have a couple blocks of tempeh in the freezer though. Would the crispy tofu technique work with tempeh as well? I’ve been baking my tofu with your recipe for quite a while and love it. I tried the rest of the recipe tonight and am crazy about it! I have to stop myself from eating it all! Thanks for the awesome recipe! I made this for me and my dad (meat eater) and he loved! Replaced the cauliflower rice for rice noodles, sesame oil for olive oil, brown sugar for coconut nectar and chili garlic sauce for garlic paste and it worked great! Delish dinner on a meatless Monday. I used kale instead of bok choy. The tofu is addictive. This is the 3rd recipe I’ve made from this website & they’ve all been winners! I made this 2x now and both times I used my whole block of tofu. It sort of dehydrates in the oven, so you end up with less & there is still plenty of sauce. My boyfriend didn’t like tofu until I made it for him. Now he likes it and says he can’t believe this is tofu because it tastes so good. I love this sauce because it has a ton of flavor. I even added a little ginger. Love using cauliflower in place of rice, but on my last Trader Joes shopping trip couldn’t find it. So, I made it without it tonight, just chunks of broccoli and it was still super good. It’s the sauce and the way the tofu is made that makes this recipe a keeper. Thanks. This recipe is delicious. I used sliced water chestnuts, bamboo shoots, carrots, sliced mushrooms, and diced yellow pepper for the vegetables. The peanut sauce is delightful. And the texture and taste of the tofu is fantastic. The cauliflower rice adds great flavor to the dish. Prepping the veggiesame and tofu and shredding the cauliflower does take some time. The veggies could be prepped ahead of time. Love this recipe. The only thing I changed is *of course* I use the whole pound of tofu! As though I’d be able to keep from snacking on them the whole time I was cooking! Thanks! This was absolutely amazing. Baking the tofu before pan frying is brilliant and I used crunchy peanut butter. My SO actually enjoyed it and stole some of mine off my plate! I always look forward to your vegan recipes. :) they are never plain or lacking! This is my new favorite recipe and one I’ll be incorporating into many more nights to come!! So incredibly delicious and I love the with rice cauliflower! My husband had no idea it wasn’t rice. Score! This is delicious, and easy to make. I roasted some onions in the oven with the tofu and mixed the onions with fried kale, it worked really well. And making the rice of purple cauliflower turned the dish into a beautiful celebration of colors. Made this for my boyfriend who is not vegetarian- and has little experience with tofu and he (and I) both really enjoyed it! We added some ginger to the sauce for an extra punch, and substituted real garlic for the garlic sauce – both turned out great. The peanut sauce is definitely a winner! What can be substituted for the chili garlic sauce? I don’t want to buy a whole jar just for 1/2 tsp and also because it has preservatives in it. I saw some people subbed minced garlic and red pepper flakes but do you have a measurement of how much to use? Making it tomorrow! Hi Sara, I was in the same predicament. I don’t like using canned anything if I can help it, so I looked up the ingredients in chili sauce and just ended up using finely chopped jalapeños and garlic with a bit of vinegar, salt and sugar. This was a great addition! Very tasty, I used almond butter and doubled the amount of chili garlic sauce. Great tip on the tofu prep, I’ve been vegetarian for 20+ years and this just changed the game! Thanks for the recipe! I really loved this. Big fan. I can’t wait to make it again. A few notes: I am not a fan of the oils used in a lot of these recipes (lots of evidence these days that grapeseed and Sesame oils are not good for you). In the sauce, I used peanut oil instead. In the stir fry (in the pan), I used olive oil (probably should have been the other way around or all peanut. I also used maple syrup in the sauce instead of brown sugar and only used 2.5 tablespoons. Can’t get over how good this recipe is, it’s in regular rotation in my household! Everyone in my family LOVED it~ no kidding… all of them like meat, but loved this dish!! looks very appetizing! is there a particular brand of chili garlic you’d recommend? So, so delicious!! I did end up using 16 oz. of pre-cubed tofu and there was a perfect amount of sauce! I also used chunky peanut butter for the extra peanut bits. Adding this to my usual rotation! So Good!!! Made this last night and the whole family loved it!!! Including my dad who is a self proclaimed non-tofu eater :). Thanks so much! I have made this about 6 times for my family, it is adored by the pickiest of small eaters and adults too! There are NEVER leftovers. I have served over cauliflower rice, brown rice, white rice and i can only imagine it would be delicious over a rice noodle. I am posting to THANK YOU for the recipe, and share that I had to make a mod today as I was out of Chili Garlic sauce. I used Sriracha instead (same amount plus a smidge more), and put a smashed garlic clove in while the tofu was marinading. Turned out really great! Love it, Love it, Love it! My kiddos eat all of it. i’m telling all my friends about it. It’s my husband favorite dish. I followed the recipe exactly, except I used 1/2 tbs more peanut butter. It was a hit with my meat- eating mother and boyfriend and will definitely be making again! I’ve been hearing about cauliflower rice so when your recipe popped up on my Google search with a pretty photo beside it, I said, Oh! that’s Dana’s website! I saw this recipe listed as one of your top choices to try. Grating the cauliflower with the cheese grater however turned out to be too messy, so I tossed the chunks into my Blendtec and hit the pulse button a few times, which worked perfectly. When my husband came home he asked what I was up to so I told him, making cauliflower rice, to which he responded, “that may be cauliflower but it’s NOT rice!” But your recipe won him over- he commented a couple of times how good it tasted and seemed pleased knowing it was healthy for us as well. The smooth peanut sauce was restaurant quality, and the pressed, baked tofu is really an improvement over just using it right out of the container. I stir fried broccoli for a colorful veggie topping. It made 3 large helpings; lunch tomorrow! This veggie dinner is definitely a hit, thank you Dana! Oh my goodness I absolutely LOVED the sauce!!!!! I was looking for a new peanut sauce recipe and this totally nailed it! Thank you again for an amazing recipe!!!! oh my goodness! this was yummy!…..husband just went back for more! i added ginger to the sauce, we are low sodium so i added more peanut butter (unsalted) and only a tablespoon of soy sauce….have some homemade pho….added that instead of the soy sauce….really, really nice….this is a keeper! This sauce is amazing. The second time around I decided to play with the recipe and used eggplant instead of tofu. I didn’t bake the eggplant, I just marinated it in the sauce and it was super tasty! Thank you so much for this recipe! It is AMAZING! My husband declared last night that I should consider this my “go-to” dish – best think I have ever made. Anyway, I also had a comment – I think the reason you are getting so many questions about the draining is because the very first thing it says after #1 is, “Begin by draining tofu 1.5 hours before you want your meal ready. ” If that is not correct, you should delete it if you are able to edit it. If it is not correct, what do you mean by draining it for 1.5 hours? It is confusing to have that be the first thing in the recipe. This recipe is delicious. I used soft tofu (the grocery store was out of firm or extra firm), and it still turned out great and crispy. I think baking the tofu is what did the trick, so don’t skip that step. I used about 3 tablespoons of honey and 2 tablespoons peanut butter. Our grocery store has frozen stirfry veggies (red pepper, snow peas, water chestnuts, broccoli) that were about $1.50 so I did that and regular rice to save time. I was really happy with the results. Five stars. Husband and I loved it. I will make this again. Could you bake the tofu, cool it, then put it in the fridge in the marinade for a few hours (rather then just 15 minutes)? Then pull out and fry as directed? I think that would work lovely! Can the tofu be baked, cooled then left in marinade overnight to be cooked the next day? Hmm, I think so but it will take on a different (maybe chewier) texture. If you try it, let me know how it goes! What can be substituted for the chili garlic sauce? I noticed someone used minced garlic and chili powder but how much? Any other substitutions for it? That will work! Minced garlic and red pepper flake, or thai red chilies (or serrano peppers, finely minced). Thank you so much for your recipes! I’m new to plant based eating and your recipes are delicious, simple to prepare and making this transition so much easier for me! I’m so happy to have found your blog!! I am not a huge tofu fan, but this was absolutely fabulous! I should also add that I added a back of stir fry veggies (it has all the best veggies- water chesnuts, baby corn,bamboo shoots) and extra sugar snap peas. If youre vegan and dont want to use brown sugar- use agave in the raw. so yummy! Wow! One of my new favorite recipes. I made this a few months ago and ate every last bite. I am not vegan, but am dairy free and try to introduce meatless foods as much as possible. Never been keen on cauliflower rice- but the sauce covers it all up and melts in your mouth. I also love how you shared this method of getting crispy tofu because I’ve always struggled with that myself. Thankyoux100! I was looking for a good tofu recipe but didn’t have cauliflower, so I made it with precooked quinoa instead (skipping step 10), to which I added sauted red pepper and carrot strips and sliced green onion. I thought the sauce was way too sweet, next time I might use half the honey/sugar, but was very impressed with the tofu! Crispy on the outside and chewy on the inside, with a lot of flavor. One of the best recipes for flavorful tofu I have come across! Will make this again with slight modifications. Its so delicious. I made it today for my husband. He liked it a lot. Thanks for the recipe. Excellent dish; well worth the work. I used firm tofu, so the early steps can be eliminated. I like crunchy dishes, so I used crunchy peanut butter and added peanuts to the final preparation. I will definitely make it again. Holy Tofu! This technique is incredible. So much so that I think I can get my meat-loving hubby on board with tofu as he loves crispy, crunchy textures. I will never prepare stir fry tofu any other way. Although, I did have a MAJOR mishap and used my Le Creuset to press the tofu. It crashed to the floor and broke a major chunk off :-( But, the delish tofu made up for it. Do you see any problem with marinating the baked tofu in the sauce for 2-3 hours? I made this and have to say if was delicious. Made a few adjustments. Used 100% maple syrup instead of sugar/honey and added a little more kick (pepper flakes). The first time I did cauliflower rice. Will be making it more often! I can’t seem to ever follow a recipe word for word, but this served as great inspiration for using ingredients I happened to have on hand. I prepared the tofu with your oven technique and that worked really well. I added some garlic, ginger, veg stock and a tiny bit of cornstarch to the sauce and it turned out amazing. Didn’t have cauliflower so I used some quinoa as the base and a random assortment of stir fry appropriate veggies to make it a complete meal. Thanks again for the wonderful inspiration! Just made it. It was very good! Thank you so much. Found this recipe on the Huffington Post article, definitely going to try it this week. I may sub the boy choy with broccoli. Love the hot pink place mat, where did you get it? I’ve never had tofu in my life so this recipe is my first foray into the world of tofu! It seems like an awful lot of brown sugar. I’m afraid it might taste like candy. Why so much? It’s wonderful!! The tofu with the sauce is so delicious and the cauliflower rice looks like real rice. Mom loves it,too. She even plans to cook eggplants with this sauce tomorrow. I made this last night and it was SUPERB! So much yum! My 5, 4 & 1 year old even gobbled it up. We served it over buckwheat soba noodles, tossed with your sauce (instead of the cauliflower). This was the first time I’ve ever been able to make tofu successfully and I will use this trick from now on. It was so great! I’m super glad we have left overs, I almost want to just eat it for breakfast today. Thanks for the recipe! The recipe was delicious! I’m new to cooking with tofu – my tofu was spongy on the inside (and crispy on the outside). Is it supposed to be spongy? Just made it! ABFAB! Question: can tofu be baked in this fashion then refrigerated ahead of time before seasoning to be used in several different recipes? Or will it lose its texture? Kids want to go vegan / veggie so looking for all the recipes I can find for tofu. I made this tonight. It was good. A little sweet for me but son thought it was perfect. I could double the tofu for the amount of sauce. I will be making again. Thanks for the recipe!! I made this last night for a make ahead week night meal. It was fantastic fresh. I added some hated ginger to the garlic when cooking the “rice” and topped the final plate with chopped peanuts, a squeeze of lime and a sprinkle of crushed red pepper. Yum!! Unfortunately I was not so impressed with the leftovers. The flavors dulled and the texture was not so appealing. I will definitely make this again, but you did all the first night! *grated ginger. ** but eat it all the first night. Had a head of cauliflower and was looking for something different to try instead of making the usual pizza crust. I came across this and it sounded so good so I gave it a go. I was amazed at just how delicious it was! I went back for seconds and will probably finish it off completely tonight! The prep time was a bit long but well worth the end result. I did end up altering the recipe slightly. First, I used vegetable oil instead of sesame oil since we didn’t have any. I also subbed the chili garlic sauce for a dash of minced garlic and a dash of chili powder. Third, I had regular soy sauce (as opposed to low sodium) so I mixed half of the amount of soy sauce the recipe called for with water. I was concerned that these changes might ruin the recipe, but I LOVED it and will absolutely be making it again! New to tofu so googled for recipes and saw this 5star rated recipe. I can understand why this is so highly rated since it has a HUGE amount of sodium/sugar and calories. No way I will subject myself to a meal with so much sugar and sodium. I will get back with you on alternate ingredients after I do some adjusting. Made this last night with a side of a detox salad. My husband and I thought this is the best recipe I’ve ever mad (I cook from scratch every day for over 15 years). My 4.5 year old ate it all and said it is yummy. Thank you for a wonderful recipe! This was so so so good!!! I am a big fan of the cauliflower rice but I have to admit when I searched for a recipe I was trying to use up some leftover rice from my Chinese food take out. Next time I am totally using the cauliflower tho. I love things spicy so I bumped up the chili last quite a bit and will actually use more next time. Thank you for this awesome recipe. By the way I have never written a review on anything but this was that good!! Dana, this is sooooooo delicious!!! You’re right, it’s a winner!!! I will be making this all the time. Especially since the calories are low. I avoided the sesame oil. It’s not a favorite so I left oil out totally and the sauce was still so YUMMY! I didn’t read all the comments, but enough to know that for some, 25 minutes is too much for the tofu. I don’t like the really chewy tofu either. So I baked my tofu for 15 minutes after preheating and it was a perfect chewiness. Also, I chopped up some mushroom, bell pepper, onion and broccoli and sautéed and added the cauliflower rice to it. What a brilliant idea!!! I’ll be making cauliflower rice often now, thank you very much! Also, I was in a hurry and so I didn’t take the step and sauté the tofu in the sauce, I just added everything into the large sauté pan and it’s all so flavorful! This is at the top of my favorites list. I love the sauce! This recipe is so simple and delicious. I’ve made it several times, and each time, it’s a hit! This meal was AMAZING! I’ve made a lot of vegetarian Asian dishes and this definitely ranks at the top. The cauliflower rice also helps make it feel a little lighter and not induce instant sleepiness :) Thank you! Can you substitute the tofu with seitan? I didn’t read ahead to buy what I needed for sauce. All I had was 2 packets of commercial soy sauce. I used the 2 packets and added lots more veggies, and even a little “real” rice (It was a left over I needed to use). 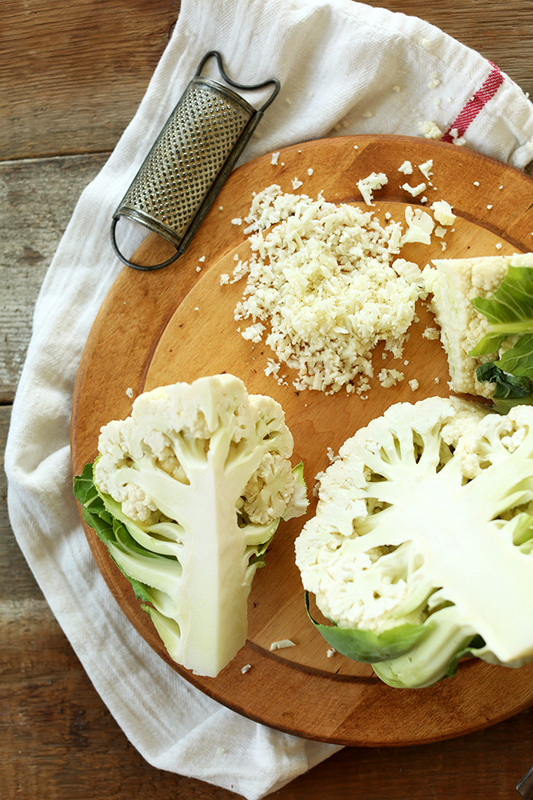 I loved the idea of using cauliflower – it was great. I plan to get some of the ingeedients that you recommend for the sauce and add it tomorrow. Loving theeeese tofu bites! I just had almond butter at home, it was super creamy :) Thanks for the recipe! I haven’t made tofu in years. I’m a little confused about the draining. Do I drain it for 1.5 hours in the fridge and then wrap in paper towels for an extra 15 minutes? Just want to make sure I don’t mess it up! Thanks! Hi Amy! I just wrap mine (straight from the fridge) in a clean towel and set something heavy on top for 15-20 minutes. That should do it! This looks amazing! To cut down a little bit of the fat (it’s good fat, either way!) can I use less PB or use PB2? I’m also wondering about using pb2 in this recipe! So I used the PB2 and it turned out great! Oh amazing! Can you tell me what you did? I’m also wondering if I can sub something for the brown sugar. I’m on a very low sugar diet at the moment, and as much as I hate to do it, I may need to use an artificial sweetener here. So I just used like, 2 tablespoons of the Pb2. It thickened with the liquids used in the recipe, tasted perfect! Definitely adding to my favorites. I am transitioning to a vegan diet but I’m also very active so I’ve had to ensure I get enough protein each day for recovery and it’s been the biggest challenge. I was tired of drinking protein shakes which led to craving real food. This was my first tofu dish I’ve tried and I was blown away. Preparation was simple and clear. So much flavor, low in carbs yet high in protein and good fat. I didn’t think it was possible. So thankful, Thank you! Wow! This is delicious. Baking the tofu… amazing! There will definitely be more tofu in my life after this! Oh, and the pb sauce… move over jelly. Love this recipe and how easy it was to make. Yum yum yum. Thank you! This is one of my favorite dishes! Fell in love with it months ago and I have it a number of times. One question, would frozen cauliflower rice cook differently? Trader joes has a pretty convenient frozen pack of it and was wondering if I could use this? Our TJ’s has fresh cauliflower rice in the produce department. This recipe is AWESOME!! Thinking that adding ginger and/or red pepper flakes to the sauce would add that touch of pungency that I missed. Trader Joes has cauliflower rice in the produce department! It’s not organic but will save some time. Easy, delicious recipe. Made tofu “pad thai,” substituting the cauliflower with rice noodles and added julienne red peppers and carrots. Peanut sauce is delicious. I doubled it and also added a bit of ginger. Baking tofu before stir frying gave it a meatier texture, and I will now bake my tofu before adding it to the pan. This is now a stable in our weeknight dinners. Thanks for sharing! Delicious way to prepare tofu. With 524 calories and 38.5 gm of carbs per serving ( must be that brown sugar), I won’t make it too often…..or just have a small portion. Calories are likely from the oil and peanutbutter. Brown sugar shouldn’t add that many calories. Unfortunately it is too many carbs for me to eat as written. The only disappointing part of this recipe was that there weren’t any leftovers! My 4 and 7 year olds LOVED this. I’ll be making it again for sure. The cauliflower rice will definitely be making an appearance on the dinner table soon. The sauce is to die for. I just made this last night and it was AMAZING! Usually I’ll make some adjustments to recipes but this one was perfect as is! 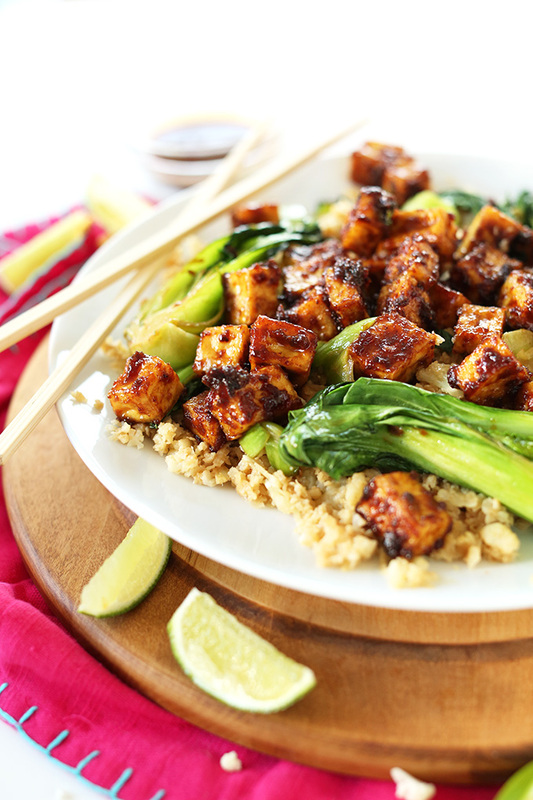 It took a while to finish, so I would recommend prepping and baking the tofu the night before if you are planning on having this as a weeknight meal. I am having to restrict carbs, fat and calories as much as possible . Can you please recommend any modifications that wouldn’t compromise too much of recipe ? Thanks ! Hi Dana, just wondering if the serving for 2 is entree size? I want to make this as a main dinner dish so want to ensure there’s enough for each person. Your advice would be greatly appreciated. Thanks! Just made this– it is amazing and will be in the regular rotation now!!! Each time I make this, it’s immediately finished by the entire family. Such a good, fast, and easy recipe! Thank you so much for sharing this!